What would you call musicians who have mastered the art of hyphenating the genres of music time and time again? What can you say about musicians who've been together almost ten years, playing the music they love to play in front of hundreds of thousands over the span of their professional careers? What would you call the sound of three individuals playing together that as a whole is much greater than one would expect from each of its parts? The answer is best summed up in three words. Wide. Mouth. Mason. As one of Canada's more interesting musical exports, Wide Mouth Mason is a trio of musicians from Saskatoon, Saskatchewan who represent the heart of a nation built of many different cultures. Comprised of Shaun Verreault (vocals, guitar), Safwan Javed (percussion, vocals), and Earl Pereira (bass, vocals), the band Wide Mouth Mason creates music that transcends the easy labels of music media and instead lays ground for a sound that is wholly the band and best heard live. 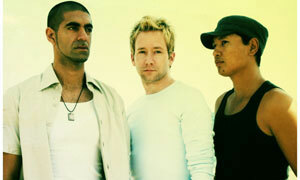 Shaun, Safwan, and Earl began playing almost ten years ago in 1993 with their first performances as Wide Mouth Mason being approximately two years later. As Wide Mouth Mason, the three young men from Saskatoon began to build a fan base, the guys taking their band name from jars of the same name that they once used to drink from. From their beginnings performing in rural Alberta in 1995, the band has seen its fan base grow in Canada and extend to other areas of the world such as the United States and in Europe. With each new fan gained often quick to share the discovery of Wide Mouth Mason's music with others who have yet to hear the band's music. While Wide Mouth Mason's four albums provide musical snapshots of a band's journey and growth, it is the opportunity of hearing the guys perform live that is something not easily described or captured, only experienced. The band has opened for such groups as AC/DC, The Rolling Stones, The Guess Who, and gaining more fans with each performance along the way. They've played at many different music festivals, including the prestigious Montreux Jazz Festival in Switzerland. Each time the three of them perform, Wide Mouth Mason has ably demonstrated at each instance the innate ability to tailor their performance to the size of their audience and the environment created with each subtle nuance of a music fan enjoying the band's music. Wide Mouth Mason has the rare ability to not just sense the music the audience is hoping to hear but to also often surprise even the most jaded listener with their versatility and range. As a live act, the band not only plays what one might expect, but also often plays what is the unexpected, whether it be adding funk to what would normally be a blues standard in front of a jazz-oriented balance or pulling the rawness of guitar and hard rhythms to introduce and invigorate the band's sound to a hard-rock inured listening public expecting to hear a perhaps more well-known rock band. The talent of the band in each of their performances indescribably gives each person in an audience the feeling that the band is performing just for them. Just as the band can never be adequately identified by the labels of the music industry, so too does the style and talent of the band be all and yet be none of the easy labels, depending on who is listening. Noteable Entertainment & Events is a Vancouver based booking agency, party rental, entertainment services and event production company. If you are interested in booking Wide Mouth Mason please contact us.